Waves Audio introduces the Waves Axis One, a Waves-optimized computer. Waves Axis One is a standardized computer, custom-designed and optimized to run Waves audio applications. Packed in a road-hardy half-rack 2U case, Axis One is a turnkey solution for live sound, broadcast and the studio. Axis One is designed from the ground up to perform reliably and consistently under demanding circumstances, with stability and solid performance. Through careful selection of components and extensive rigorous testing, it has been optimized to match the needs of sound engineers using Waves software applications. With its rugged rack-mountable case, this unit is designed to help any engineer deliver sound reliably, anywhere, anytime. 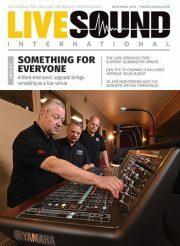 With its Waves SoundGrid connectivity, Axis One can act as the “brain” of a SoundGrid system, seamlessly interfacing with SoundGrid I/O devices and servers. Use it at front of house, at monitor position, or in your broadcast AV rack – or add it to your studio for tracking, mixing and mastering.